An image from the Hubble Space Telescope showing debris expanding into space from a typical nova outburst that occurred decades before this picture. The featured research using SOFIA was focused on Nova Delphini 2013, which is too recent to allow a resolved picture of its debris cloud. Observations made with NASA’s flying observatory, the Stratospheric Observatory for Infrared Astronomy indicate that nova eruptions create elements that can form rocky planets, much like Earth. Astronomers occasionally see a nova, which may appear as a “new” star that grows brighter and then fades away after a few weeks. In fact, “nova” (plural, novae) is the Latin word for “new.” We now know that novae are not actually new stars, but rather are associated with stellar old age: explosions occurring on the surfaces of burned-out stars. They are less violent and more common than the star-shattering explosions called supernovae that completely destroy an aging star. Principal investigator Bob Gehrz of the University of Minnesota Twin Cities, and collaborators have been using SOFIA to study novae as part of an ongoing research program to understand the role these objects play in creating and injecting elements into the material between the stars called the interstellar medium. Gerhz and his team found high levels of elements such as carbon, nitrogen, oxygen, neon, magnesium, aluminum and silicon in the Nova Delphini, which erupted in 2013 in the constellation Delphinum (the Dolphin). Some of these elements can be found in living things, whereas others are important constituents of rocky planets such as Earth. There is evidence that when the universe began in the Big Bang, only trace amounts of elements other than hydrogen and helium were created. Atoms of heavier elements were made later by processes inside stars, or during star death throes such as nova and supernova explosions. 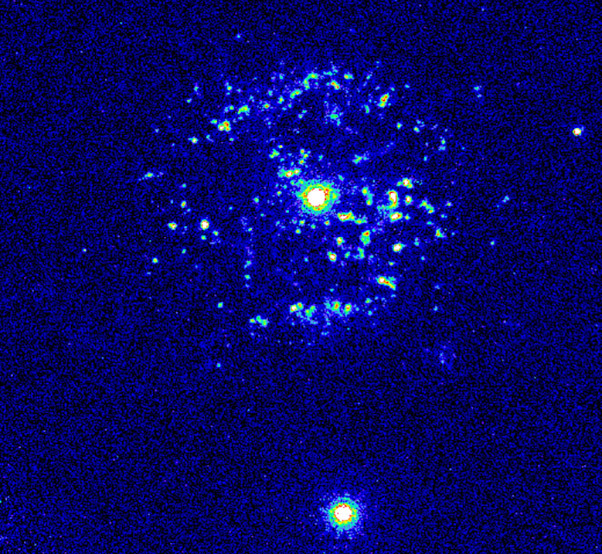 The observations of the Nova Delphini debris cloud indicate that novae in general may be a major source of medium-weight elements in the universe. Their paper was published in the Astrophysical Journal. NASA’s Stratospheric Observatory for Infrared Astronomy 747SP taking off just before sunset from Air Force Plant 42 in Palmdale, Calif., Sept. 15, 2015. The observations for these findings were gathered with the FORCAST instrument on SOFIA, the Faint Object infraRed CAmera for the SOFIA Telescope, which can gather images and spectra of planets, stars, interstellar clouds and galaxies at mid-infrared wavelengths. 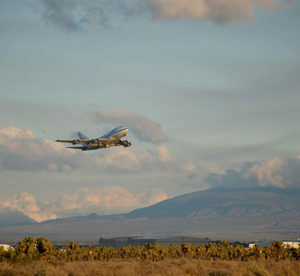 SOFIA is a Boeing 747SP jetliner modified to carry a 100-inch diameter telescope. NASA’s Ames Research Center in Moffett Field, Calif., manages the SOFIA program. The SOFIA Science Center is based at Ames and managed by NASA in cooperation with the Universities Space Research Association of Columbia, Md., and the German SOFIA Institute at the University of Stuttgart. 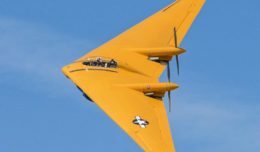 The aircraft is based at NASA’s Armstrong Flight Research Center facility in Palmdale, Calif.